NUIG 2-9 Mayo 1-7 (Dangan, 9/1/2005). MAYO: Fintan Ruddy; Trevor Howley; David Heaney, Pat Kelly; Alan Roche, James Nallen, Liam O’Malley; Billy Joe Padden, Robert Fahey; James Gill, Alan Dillon (1-2, two frees), Niall Lydon; Eoin Gallagher (0-1), Conor Mortimer (0-4), Michael Conroy. Subs: Pat Navin for Fahey, Alan Moran for Gallagher. IT Sligo 0-12 Mayo 1-10 (Ballinode, 16/1/2005). MAYO: David Clarke; Trevor Howley, Garry Mullins, Pat Kelly; Alan Roche, Alan Moran, Liam O’Malley; Robert Fahey (0-2), James Nallen; James Gill, Alan Dillon (0-5, four frees), Niall Lydon (0-1); Michael Conroy (0-2), Marty McNicholas (1-0), Eoin Gallagher. Subs: Damien Munnelly for Lydon, Colm Forde for Gallagher, James Kilcullen for Fahey, Dara Sloyan for McNicholas, Trevor Lydon for O’Malley. Mayo 1-11 Roscommon 0-9 (Ballyhaunis, 23/1/2005). MAYO: Fintan Ruddy (0-1, free); Pat Navin, Pat Kelly, Alan Moran; Garry Mullins, Liam O’Malley, Alan Roche; Robert Fahey, James Kilcullen (0-1); James Gill (0-1), Alan Dillon (0-1), Michael Conroy; Conor Mortimer (0-4), Damien Munnelly (1-0), Eoin Gallagher (0-2). Subs used: Dara Sloyan (0-1), Peadar Gardiner, Kieran Sheridan, Columba Holleran. Dublin 2-13 Mayo 1-15 (Parnell Park, 6/2/2005). MAYO: F Ruddy; P Kelly (0-1), D Heaney, L O’Malley; G Mullins, J Nallen, P Gardiner; J Gill (0-1), J Kilcullen; A Moran (0-1), C McDonald (0-5, three frees, one from a penalty), A Kilcoyne; C Mortimer (0-3, one free), D Munnelly (0-2), J Prenty (0-2). Subs: K Higgins for D Heaney (45 mins), C Moran for G Mullins (47 mins), BJ Padden for D Munnelly (53 mins), A Costello (1-0) for A Moran (56 mins), A Roche for A Costello, yellow carded, (70 mins). Mayo 2-10 Donegal 1-11 (Ballina, 13/2/2005). MAYO: D Clarke; K Higgins, P Kelly, L O’Malley; G Mullins (0-1), James Nallen, P Gardiner; B J Padden, J Kilcullen; J Gill (0-2), C McDonald, A Kilcoyne; C Mortimer (1-4), A Dillon (1-2), J Prenty (0-1). Subs: C Moran for Mullins, T Mortimer for Kilcoyne, A Moran for Prenty, A Costello for Kilcullen. Mayo 0-14 Cork 0-11 (Ballina, 6/3/2005). MAYO: D Clarke; L O’Malley, D Heaney, G Mullins; P Kelly, J Nallen, P Gardiner; M Moyles, BJ Padden; J Gill (0-2), C McDonald (0-3), A Kilcoyne (0-4); C Mortimer (0-3, one free), A Dillon, J Prenty (0-2). Subs: Andy Moran for J Prenty (62 mins), D Munnelly for M Moyles (63 mins), Alan Moran for BJ Padden (70 mins, yellow card). Offaly 2-11 Mayo 2-12 (Tullamore, 13/3/2005). MAYO: D Clarke; L O’Malley, D Heaney, K Higgins; G Mullins, J Nallen, P Gardiner; M Moyles, BJ Padden; J Gill, C McDonald (0-2, both 45s), A Kilcoyne (1-1); C Mortimer (0-4, all frees), A Dillon (0-4, one free), J Prenty (1-0). Subs: A Moran for Moyles (31 mins, inj), P Kelly (0-1) for Heaney (47 mins, inj). Tyrone 1-11 Mayo 0-16 (Omagh, 20/3/2005). MAYO: D Clarke; L O’Malley, D Heaney, K Higgins; G Mullins, J Nallen (0-1), P Gardiner (0-2); J Gill, B J Padden (0-1); A Moran, A Dillon (0-2, one free), A Kilcoyne (0-1); C Mortimer (0-5, four frees), T Mortimer (0-3), J Prenty. Subs: P Kelly for Gill, inj (six mins), C Moran (0-1) for Mullins, yellow card (nine mins), M Conroy for Prenty (half-time), D Geraghty for Moran (48 mins), A Costello for Kilcoyne, yellow card (53 mins). Mayo 0-15 Kerry 1-16 (McHale Park, 27/3/2005). MAYO: D Clarke; L O’Malley, D Heaney, K Higgins; G Mullins, J Nallen, P Gardiner (0-2); R McGarrity, BJ Padden; A Moran (0-1, free), C McDonald (0-3), A Kilcoyne; C Mortimer (0-6, 3 frees), A Dillon (0-1), T Mortimer (0-1). Subs: M Moyles (0-1) for Kilcoyne (41 mins), J Prenty for Dillon (53 mins), P Kelly for Mullins (64 mins). Mayo 3-16 Westmeath 1-8 (McHale Park, 3/4/2005). MAYO: D Clarke; L O’Malley, D Heaney, K Higgins; C Moran (1-0), A Roche, P Gardiner; R McGarrity, BJ Padden (0-3); A Moran (1-5), C McDonald (1-0, penalty), A O’Malley; C Mortimer (0-4), T Mortimer (0-2), P Harte (0-1). Subs: D Munnelly (0-1) for T Mortimer (yellow card, 33 mins), D Geraghty for O’Malley (34 mins), M Conroy for Harte (51 mins). Semi-final: Armagh 0-19 Mayo 0-14 (Croke Park, 24/4/2005). MAYO: D Clarke; K Higgins, D Heaney (0-1), D Geraghty; C Moran, J Nallen, P Gardiner (0-2); R McGarrity, BJ Padden; J Gill, C McDonald (capt; 0-2, one free), A Moran (0-1); C Mortimer (0-3, all frees), T Mortimer, A Dillon (0-4, three frees). Subs: B Maloney (0-1) for T Mortimer (yellow card, 23 mins), M Conroy for C Mortimer (yellow card, 48 mins), A Kilcoyne for A Moran (55 mins), P Harte for Conroy (67 mins). Semi-Final: Roscommon 0-11 Mayo 1-16 (Hyde Park, 19/6/2005). MAYO: D Clarke; K Higgins, D Heaney, G Ruane; C Moran, J Nallen, G Mullins; R McGarrity, S Fitzmaurice; A Moran (0-2), C McDonald (0-2, one free), A Dillon (0-1, free); C Mortimer (1-4, three frees), BJ Padden (0-2), S Carolan (0-2). Subs: J Gill (0-1) for A Dillon (half-time), T Mortimer (0-2) for S Carolan (55 mins), B Moran for S Fitzmaurice (67 mins). Final: Galway 0-10 Mayo 0-8 (Pearse Stadium,10/7/2005). MAYO: D Clarke; D Geraghty, D Heaney, G Ruane (0-1); C Moran, J Nallen, P Gardiner; R McGarrity, S Fitzmaurice; A Moran, C McDonald (0-1, free), A Dillon (0-1, free); C Mortimer (0-4, two frees), BJ Padden (0-1, free), T Mortimer. Subs: J Gill for A Moran (half-time), P Kelly for C Moran (half-time), B Maloney for A Dillon (53 mins), L O’Malley for P Gardiner (56 mins) inj. Fourth round: Mayo 0-11 Cavan 0-8 (Hyde Park, 30/7/2005). MAYO: D Clarke; D Geraghty, D Heaney, G Ruane; P Kelly, J Nallen, P Gardiner; R McGarrity (0-1), S Fitzmauice; M Moyles (0-3), C McDonald (0-1), A Dillon (0-3 one free); C Mortimer, BJ Padden, A O’Malley (0-3). Subs: M McNicholas for Mortimer (51 mins), J Gill for Moyles (56 mins), B Moran for Fitzmaurice (70 mins). PRELIMINARY ROUND: Mayo 1-17 Roscommon 1-11 (MacHale Park, 19/3/2005). MAYO: R Byrne; T Lydon, C Halloran, K Higgins; E Hughes, J McAndrew, T Gaughan; B Kelly (1-0), J Kilcullen; A Costello (0-3, one free), M Conroy, A Kilcoyne (0-5, three frees); J Dillon (0-1), D Munnelly (0-7, five frees), J Prenty. Subs: C Boyle for Halloran, A Durcan (0-1) for Prenty, M Hannick for Dillon, K Costello for Hughes. SEMI-FINAL: Mayo 1-18 Leitrim 1-11 (MacHale Park, 25/3/2005). MAYO: R Byrne; T Gaughan (0-1); C Halloran, K Higgins; E Hughes, J McAndrew, S Melia; B Kelly, J Kilcullen; A Durcan (0-5, four frees), S Hughes (0-1), A Kilcoyne (0-6, four frees); M Conroy, D Munnelly (0-2, one free), J Prenty (1-2, one free). Subs: C Boyle for Halloran, K Costello (0-1) for E Hughes, J Dillon for S Hughes, M Hannick for Kilcoyne, A Joyce for Dillon. FINAL: Galway 1-13 Mayo 0-4 (Pearse Stadium, 9/4/2005). MAYO: Richard Byrne; Tony Gaughan, C Halloran, Keith Higgins; Eoin Hughes, James McAndrew (0-1), Colm Boyle; Barry Kelly, James Kilcullen; Alan Costello, Aidan Kilcoyne (0-1), Alan Durcan; Michael Conroy, Damien Munnelly (0-2, one free), John Prenty. Subs: Kevin Costello for Prenty, Stephen Hughes for Durcan, Trevor Howley for Costello, Marcus Hannick for S Hughes. SEMI-FINAL: Mayo 4-12 Roscommon 0-7 (MacHale Park, 25/6/2005). MAYO: Kieran Barnicle; Padraic Healy, Ger Cafferkey, Dara Conway; Chris Barrett, Tom Cunniffe, Dara Hughes (1-0); Seamus O’Shea, Tom Parsons; Aidan Campbell (0-3), Martin Conroy (1-1), Padraic O’Connor (0-4, three frees); Ronan O’Boyle (0-2), David Kilcullen (1-1), Enda Kenny (1-0). Subs: Pearse Hanley for Conroy, Mikey Sweeney (0-1) for O’Boyle, Darren Reape for Cunniffe, David O’Mahony for Kenny. FINAL: Galway 0-10 Mayo 0-9 (Pearse Stadium, 10/7/2005). MAYO: Kieran Barnicle; Padraic Healy, Ger Cafferkey, Dara Conway; Chris Barrett (0-1), Tom Cunniffe, Dara Hughes; Seamus O’Shea (0-1), Tom Parsons; Aidan Campbell (0-5, four frees), Martin Conroy, Padraic O’Connor (0-1); Ronan O’Boyle (0-1), David Kilcullen, Enda Kenny. Subs: Pearse Hanley for O’Connor, Darren Reape for Conway, Sean Kelly for Parsons, Mikey Sweeney for Kenny, Kieran Barrett for O’Shea. QUARTER-FINAL: Mayo 0-10 Armagh 1-6 (Dr Hyde Park, 30/7/2005). 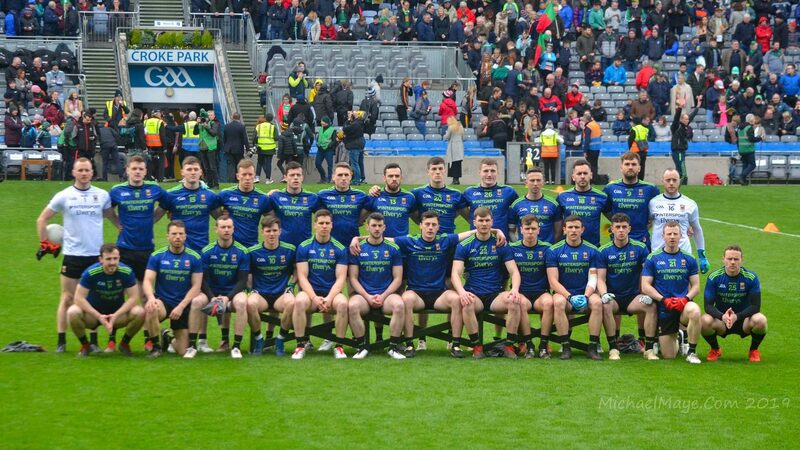 MAYO: Shane Nallen; Padraic Healy, Ger Cafferkey, Dara Conway; Chris Barrett, Tom Cunniffe, Dara Hughes; Peter Collins, Dermot O’Connor; Pearse Hanley (0-3), Aidan Campbell (0-4, two frees), David Kilcullen; Ronan O’Boyle (0-1), Padraic O’Connor (0-2, one ’45 and one free), Ger O’Boyle. Sub: Sean Kelly for Ger O’Boyle. SEMI-FINAL: Mayo 1-12 Kerry 0-14 (Croke Park, 28/9/2005). MAYO: Shane Nallen; Padraic Healy, Ger Cafferkey, Dara Conway; Chris Barrett (0-1), Tom Cunniffe (0-1), Dara Hughes; Peter Collins, Pearse Hanley (0-1); Aidan Campbell (1-1), Dermot O’Connor, Padraic O’Connor (0-4, one free); Ronan O’Boyle (0-1), David Kilcullen, Ger O’Boyle (0-1). Subs: Seamus O’Shea (0-2) for Conway, James Noone for Dermot O’Connor. FINAL: Down 1-15 Mayo 0-8 (Croke Park, 25/9/2005). MAYO: Shane Nallen; James Burke, Ger Cafferkey, Padraic Healy; Chris Barrett (0-1), Tom Cunniffe, Dara Hughes; Peter Collins, Dermot O’Connor (0-1); Pearse Hanley, Aidan Campbell (0-4, frees), David Kilcullen; Ronan O’Boyle (0-1, free), Padraic O’Connor, Mikey Sweeney. Subs: Seamus O’Shea for Burke, Ger O’Boyle for Padraic O’Connor, Kieran Barnicle for Nallen, Sean Kelly for Kilcullen, James Noone (0-1) for Ronan O’Boyle.